If you ever wonder what goes on in the heads of our rulers, then you must be “grateful” for the answer you got on Sunday, 12 June 2012, from the president himself, Dr Goodluck Jonathan. I say grateful hesitantly because if you are like me, then you must have been saddened beyond words by the president’s response to the simple question of moral obligation raised by his refusal to declare his assets publicly. Still, grateful because you no longer have to speculate about the moral bankruptcy of those that claim to be our leaders. The world will remember his answer for as long as corruption and the crafty ways of the corrupt remain a major cause of the poverty and misery that stalk the land. And if you are one of the few optimists who had been waiting for the day the president would discover his spine and take a stand, then that Sunday of his instantly famous media chat was the day. Asked why he was yet to declare his assets publicly, the president made a public declaration of a different sort: a defence of secrecy laced with utter contempt for the people and the spirit (morality) of the constitution he swore to uphold. He said, “I don’t give a damn about that. The law is clear about it and so making it public is no issue and I will not play into the hands of people. I have nothing to hide. I declared assets publicly under the late President Umaru Musa Yar’Adua because he did it, but it is not proper. … You don’t need to publicly declare it (sic) and it is a matter of principle.” None of the reports of this media chat says the president had just come from worshipping the Lord and rededicating himself to the truth in church, but how his words remind of that well-known biblical saying, “Ye shall know the truth, and the truth shall make you free!” No man is freer than he who not only knows but tells the truth and damns the consequences. 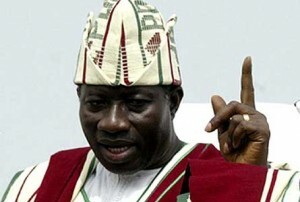 Jonathan has set himself free of the monstrous burden imposed on him by the late Yar’Adua. He is free, at last, of all that stupidity of “servant leaders” and “leading by example” that only lead to public assets declarations and “playing into the hands” of enemies. But I wish the president had been content to defend corruption through secret assets declarations and not gone into all that laughable talk of principle and “nothing to hide.” I can understand how a man who sold himself to the electorate as a poor, barefoot and humble fisherman’s son can say to that same electorate “I don’t give a damn” after a few years of billion-naira food budgets, billions more in security votes and control of the treasury. What I am not as quick to understand is how a purported doctor of philosophy could ever confuse self-serving deviousness with principle. “I declared assets publicly under the late President Umaru Musa Yar’Adua because he did it, but it is not proper,” he fumed, too angry to recognise his self-indictment. Pray, where is the principle in this? I see no principle, neither does anyone else criticising the president “from heaven” or hell or the country falling apart under his watch here on earth. What I see is a man still furious with his dead boss for compelling him to reveal his transformation into a multi-millionaire at the expense of the people. When that happened, we learned that between the time he was a lecturer and when he became vice president, he had acquired properties and moneys to the tune of N295million. Much of that while he was deputy governor and vice president, and so not the man holding the purse-strings. How much more can he be worth now? In Jonathan’s new and expensive shoes, I would want to hide my riches from public scrutiny. Knowing that no explanation other than a lucky day playing the lottery (and Jonathan is the luckiest man alive), a family inheritance (but not with that barefoot boy biography) or a mysterious benefactor as in Charles Dickens’s Great Expectations, would explain my new-found wealth, I would fulfill the letter of the law and rejoice that it does not enjoin public declaration. And then I would say that my furtiveness is a matter of principle; you see, “I have nothing to hide!” For why “play into the hands” of my enemies? And for sure, Jonathan’s enemies are many, among whom I must be one. If you think that public assets declaration is a moral imperative superior to laws and edicts; if you think that his strange principle of secrecy over transparency is compelling evidence of just how unfit he is for high office, you are his enemy. Never has a man with nothing to hide fought so ferociously to keep his hands in his pockets when he should turn them out and hang the trousers in the public square for all to see. But Jonathan is right. His assets declarations may be locked in the dark rooms of the Code of Conduct Bureau but they remain public documents. Which means that they belong to the people. By all means necessary, we must assert our citizenship right to the nothing-to-hide assets declarations of our don’t-give-a-damn president.